In this season of rampant anti-statue-ism, where Cecil Rhodes must fall, Edward Colston must tumble, Robert E Lee must be toppled, Captain Cook must yield, Admiral Horatio Nelson must be pulled down and even poor Mahatma Gandhi must hit the dirt, it appears that symbols and memorials of the past have become our battles of the present: drab and cold grey monuments have morphed into vibrant Technicolor movements for change – not so much an organic change of culture as a crusade to revolutionise apprehensions of history and truth. Yesterday’s wise and virtuous are today’s racists and bigots: why would we want to memorialise wickedness or celebrate evil? Don’t statues of a conquering white supremacist and slave-traders offend against all that is noble, right, pure, lovely and admirable? 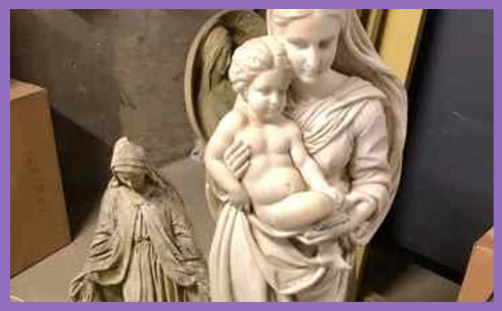 A Roman Catholic school in California, the San Domenico School in San Anselmo, has gone a step further: Mary must fall; Jesus must tumble; Mary and the baby Jesus together is just too much for non-Catholics to cope with, and so their statues must be pulled down. The Holy Family is offensive to non-Christians, and so, in the name of inclusion, their images must be expunged from a Catholic school? “If you walk on the campus and the first thing you confront is three or four statues of St. Dominic or St. Francis, it could be alienating for that other religion, and we didn’t want to further that feeling,” (said) Amy Skewes-Cox, who chairs the school’s board of trustees. Cecily Stock, who is head of the school, said most students are not Catholic. …”Our goal in this shift was in alignment with our strategic plan that was approved by our Board of Trustees and Dominican Sisters of San Rafael in June of 2016 and reflects our commitment to continuing a 167-year tradition of inclusive education,” Kimberly Pinkson, director of marketing and communications, told Fox News. There’s an interesting debate about mission to be had here, in particular about the Christian mission in education, but the knee-jerk temptation for many will be to denounce the school’s ‘betrayal’ of its Christian heritage and ‘denial’ of its foundational ethos, or decry the ‘liberal’/’weak’/’insane’ headteacher and board of trustees for their offensive compromise with the world: “Articulating an inclusive foundation appears to mean letting go of San Domenico’s 167-year tradition as a Dominican Catholic school and being both afraid and ashamed to celebrate one’s heritage and beliefs,” said Shannon Fitzpatrick, a parent with an 8-year-old son at the school. You could take the line that this is fundamental denial of Christ: ‘But whosoever shall deny me before men, him will I also deny before my Father which is in heaven‘ (Mt 10:33). But we’re talking here about statues, not ethos. You can eliminate the word ‘Christian’ and still be Christian; you can topple a statue of Jesus because it is nothing but an effigy and it’s more important that he is Lord of your heart than a marble block in the lobby. God is beyond being: Christ is beyond that which captivates the gaze. These statues might provoke visions and render visible the invisible, or they might stand as confirmation of spiritual petrification. Some may worship, revere and adore them, for they make present that which is wholly ‘other’. But in a school of moral formation and intellectual development, where the majority know little or nothing of the God of alterity, what love and gift of salvation is really encountered in an effigy? There may, of course, be aesthetic illumination in the form of Jesus and his mother for those who believe, but if secular liberalism rejects Adam’s Fall, and that is the pervasive belief of students and parents, what purpose do statues of God-centred redemption actually serve? If they are considered stumbling blocks to the weak, are they really indispensable? Are not schoolteachers a better living incarnation of Christian values, and a superior reification of Christian ethos? The task of education is to emancipate humanity from ignorance and poverty through enlightenment and empowerment so that people might be masters of their own destiny. In Roman Catholic schools – indeed, in all Christian schools – the intellectual and moral aspects of education are complemented by the mission to reunite fallen humanity with its creator. Is it not possible to contemplate the ethical Christ without statues? Is it not preferable to inquire into the consonance of Christianity with reason in the absence of outward forms and images of divine relationship? Christian education is a box of competing tensions: there is the pursuit of knowledge, the formation of character, the facilitation of social harmony, issues of moral utility and questions of ultimate truth. These combine to bring children from darkness to light by guiding them from their caves of ignorance into open spaces of truth. To be Christian is not to be obsessed with statues, but to be concerned with authentic relationship with God. Christian education must ultimately liberate children to engage intelligently with a range of conflicting belief systems and a spectrum of mutually exclusive philosophies: the precise content of a child’s belief is less important than the manner in which it is held. Are students really gleaning virtue, wisdom and civility from the zealous defence of statues? Are these marble forms really intrinsic to children’s spiritual, moral, cultural, mental and physical development? God’s presence in a Christian school is not contingent on images and effigies: His Spirit is ubiquitous, and the institutional ethos and cultural values flow from the faith of those who govern, lead and teach. You may consider the removal of Christian statues to be somehow symbolic of an ever-encroaching secularism, but Christ himself might just enter this school’s lobby and topple such idols, for all teaching is confessional: it is adult hearts and mouths which convey beliefs to children’s minds and inculcate values in their souls. Jesus might just be a little more concerned with the indoctrination of society’s biases, prejudices and mores than with the ossification of his infancy and his mother’s perpetual virginity. Pope Francis says the rights of migrants trump the security of nations. Will he disband the Swiss Guard, tear down the Vatican City Walls, and put up a sign saying ‘Mi casa su casa’?